Sunay Urs - a five-year-old Lego superfan from Manchester - has won a competition to have himself built out of his favourite bricks! It took 7,400 blocks to make the creation. He currently spends two hours every day before and after school playing with the bricks, and one day hopes to become an official Lego Master Builder. 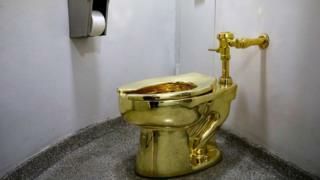 This piece of art is a loo made of solid gold worth one million pounds. Designed by an Italian artist, it was installed last year in New York's Guggenheim Museum. It works just like a normal toilet, but more than 100,000 visitors had already queued up to spend a penny shortly after it was unveiled. This sculpture is made from oranges and lemons! 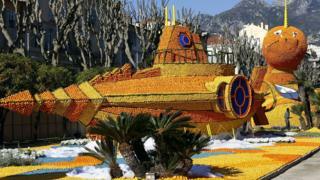 The incredible piece of art was made for a lemon festival which takes place every year in the town of Menton in France. We hope the visitors don't leave feeling at all... bitter... Sorry, we couldn't resist. From the really big to the very small. Artist Chien Chu Lee from Taiwan carves these amazing mini-works of art from pencil lead - the head of the pencil to be precise. 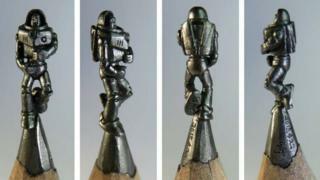 His tiny sculptures can be as tiny as 0.1mm long and can take hours to complete. He said it takes a lot of patience and a steady hand. We're not surprised! 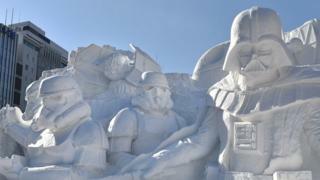 This huge Star Wars-themed snow sculpture was created for the annual Sapporo Snow Festival in Japan. It's now in its 68th year and this year features over 250 different sculptures. The festival first started in 1950, when high school students built a couple of snow statues in the local park. 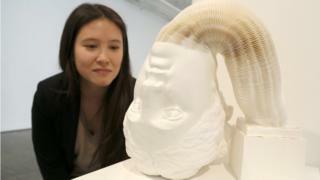 Although at first glance these sculptures by Chinese artist Li Hongbo might look like they've been made out of of plaster or stone they have in fact been made from paper. He makes them by sticking together stacks of paper with glue, he then cuts, chisels and sands them into the shape that he wants. 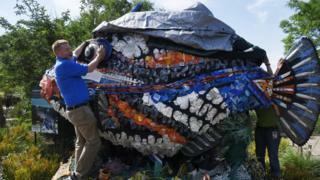 This particular sculpture is plastic waste collected from beaches in the US. Artist Angela Pozzi has been making these marine animal sculptures out of plastic since 2010. She hopes it will teach people more about pollution and how it affects the environment. 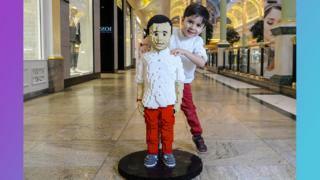 Just like Sunay's model, this sculpture by artist Nathan Sawaya is also made entirely out of Lego. 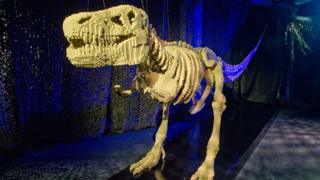 Nathan is famous for making artwork out of the plastic bricks and this impressive looking T-Rex was one of many put on display for his The Art of the Brick show last year. 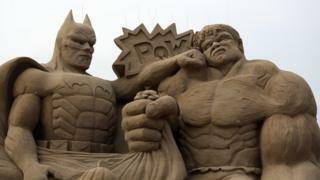 You might have seen sculptures made of sand on a visit to the beach, but we wonder if they were as impressive as this! This work was sculpted for a festival which takes place annually in Weston-super-Mare on the west coast of England. Around 4,000 tonnes of sand were brought in from the beaches nearby to build the sculptures. This particular one was part of a special Hollywood-themed display back in 2013. 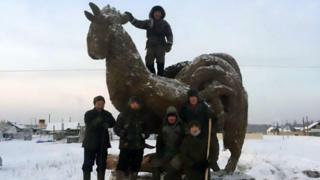 Finally, hold your noses for this last work, which a Russian farmer made out of poo! Mikhail Bopposov creates a sculpture each year for Chinese New Year. As you can see from the picture, this one was made for the year of the rooster.